Reubens become party food with these delicious Reuben Fritters with a Thousand Island Dipping Sauce. The base is mashed potatoes with chopped corned beef, swiss cheese, and sauerkraut added in. 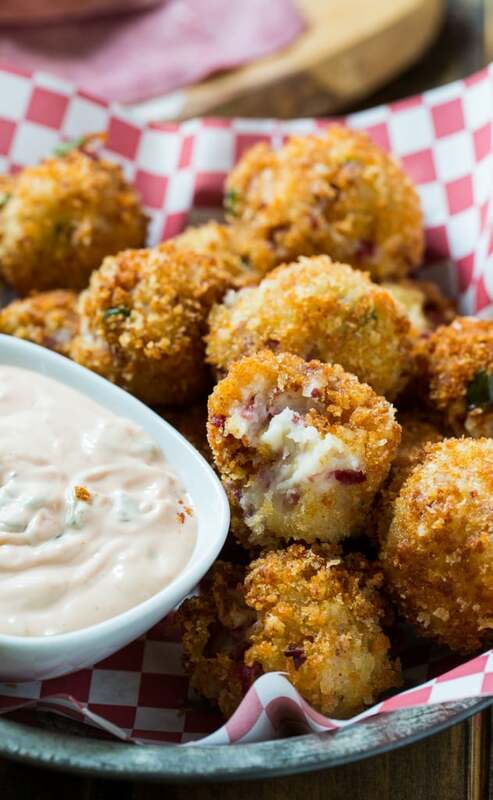 They’re formed into balls, coated in Panko crumbs, and fried until golden. Anything tastes good deep-fried right? Especially when dipped in sauce. Reuben sandwiches are my favorite. I love the tang of the sauerkraut, the gooey swiss cheese mixed with the sweetness of a Thousand Island dressing or Russian Dressing. Besides a traditional Reuben sandwich, there are all kinds of ways you can enjoy the flavors of a Reuben including Reuben Dip and Reuben Crescent Rolls. This is a great recipe to make when you have leftover mashed potatoes or you made Reuben sandwiches and just have a little of each ingredient left. 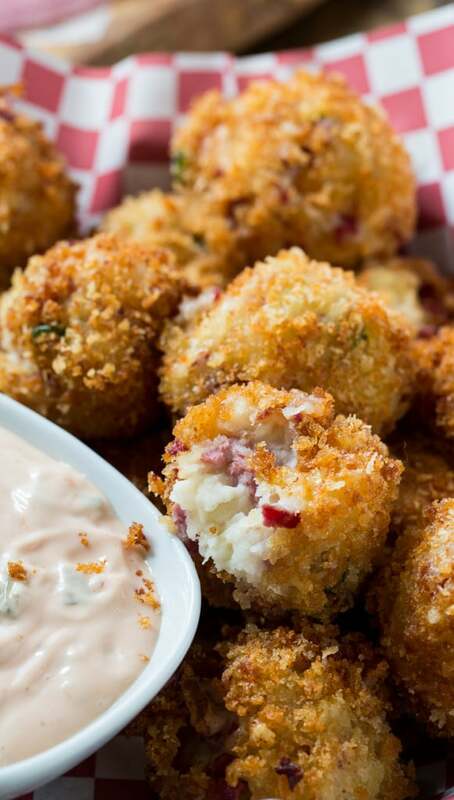 Reuben Fritters are made from mashed potatoes with chopped up corned beef, sauerkraut, and swiss cheese mixed in. 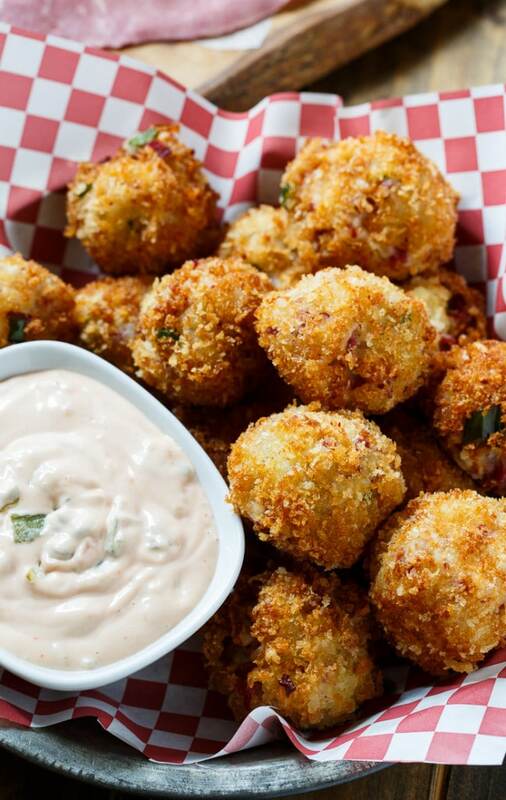 Fried until crispy and served with Thousand Island dressing. Combine all ingredients for Thousand Island sauce in a bowl and refrigerate. In a medium bowl, mix together mashed potatoes, corned beef, swiss cheese. sauerkraut, and green onions. Form into balls a little smaller than golf balls. In a bowl, whisk together eggs and water. Place panko crumbs in a pie plate. 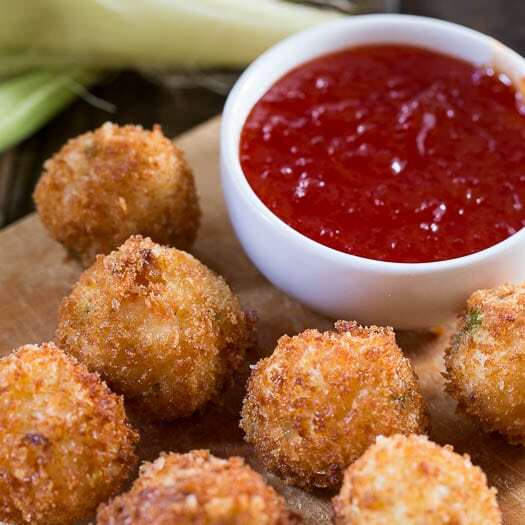 Dip each fritter ball in egg mixture and then coat in panko crumbs. Refrigerate for at least 30 minutes. Pour about 2 inches of vegetable oil in a large pot or Dutch oven. Heat oil to 350 degrees and fry fritters in batches until golden. This entry was posted in Appetizers and tagged corned beef, fritters, reuben. Bookmark the permalink. So disappointed in the Reuben fritter. Potatoes do not belong in a rueben. Even added more cornbeef and kraut to kick it up . Didn’t really change the taste. Will not be making them again. These look perfectly crispy and so delicious! Such a great idea! I love the sound of the dip too! These are super fun, my husband would love them! Looks so crispy! What a great idea to use as fritters! I bet this would be gone soon at the parties. Your dip looks delicious, too! I just got some sauerkraut the other day so now I think I know a good way to use it. These look crazy good! My mouth is watering. ? 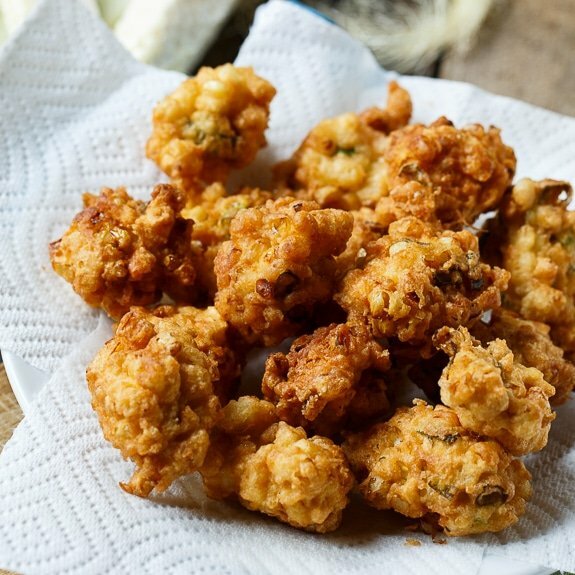 These fritters look INSANELY good, Christin! This is seriously such a genius idea, and I’m pretty sure I could easily devour all of these beauties! Oh this is such a good idea, Christin! I think I would devour this entire batch in no time. I love your creative spin on a classic! 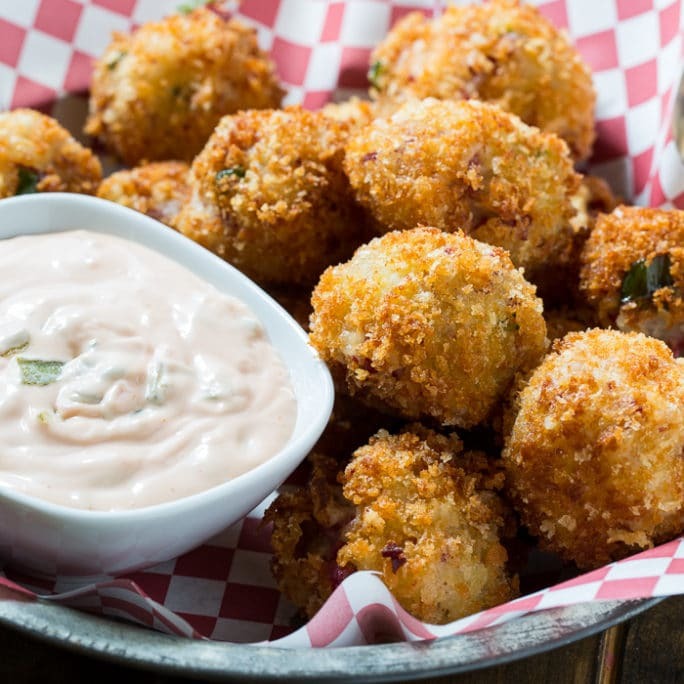 The world would be a sad place without fried food. I’m always tossing out leftover mashed potatoes. What a creative way to repurpose it in Rueben fritter form! I love all that deep fried golden exterior, Christin! Yum, Christin! I’ve got some Reuben recipes coming down the pike too. These look AMAZING. Well don’t these just look ALL KINDS OF yum! Oh these are making me start to get hungry for dinner!! And with that sauce for dipping …. Reubens are my all time favorite sammies, so when I saw these on Instagram, I almost fell outta my chair! Talk about crazy deliciousness that I want up in my face IMMEDIATELY! These fritters are bomb, Christin! And that dip I just want to slather on all the things! PINNED! Cheers, friend! These look so golden brown and crispy, and it was such a genius idea to give these fritters a reuben twist! Wow, these are such a great idea! You always make the best fried food, Christin. The dip sounds irresistible too! 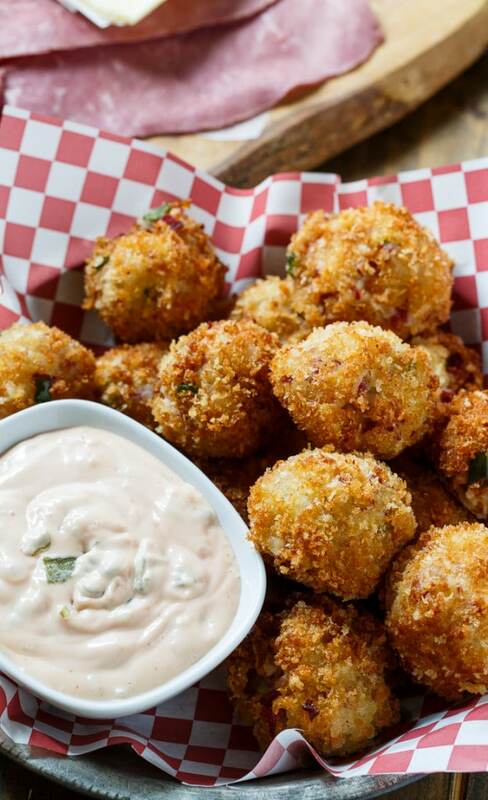 Oh my, these sound sinful! I love getting reubens out, so have never made them at home. These seem like the perfect excuse to do so though!